Droughtlander ended a month early for the lucky fans who made it to Starz’ Outlander panel at the New York Comic Con. Starz surprised the audience with a screening of season four’s first episode followed by a panel featuring Sam Heughan (“Jamie Fraser”), Caitriona Balfe (“Claire Randall Fraser”), Sophie Skelton (“Brianna Randall”), Richard Rankin (“Roger Wakefield”), writer/executive producer Ronald D. Moore, and executive producer Maril Davis. Outlander author Daiana appearance at the panel was another surprise for New York Comic Con Outlander fans. If you weren’t able to attend NYCC, then you’ll have to patiently wait for the season four premiere on November 4, 2018. However, Starz did bring the fourth season’s “Americana-themed” title credits online for fans to check out. “Season Four of Outlander continues the story of time-traveling 20th century doctor Claire Fraser and her 18th century Highlander husband Jamie Fraser as they try to make a home for themselves in colonial America. 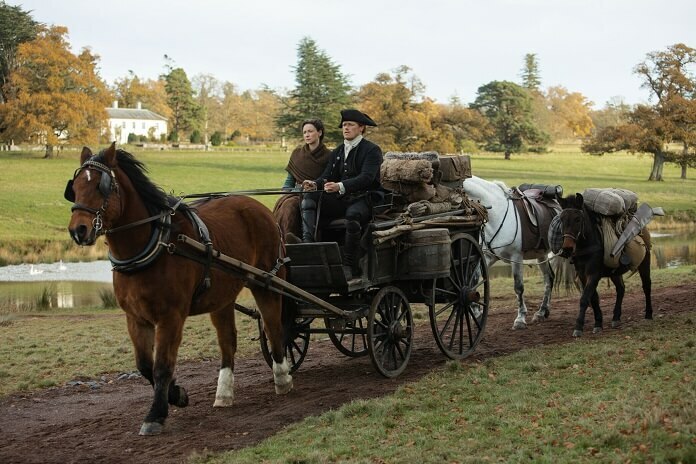 We find the Frasers in North Carolina, in a place called Fraser’s Ridge at yet another turning point in history – the cusp of the American Revolution. As Claire and Jamie build their life together in the rough and dangerous backcountry of North Carolina, they must negotiate a tenuous loyalty to the current British ruling class, despite Claire’s knowledge of the bloody rebellion to come. “Book Three picks up right after Claire (Balfe) travels through the stones to return to her life in 1948. Now pregnant with Jamie’s (Heughan) child, she struggles with the fallout of her sudden reappearance and its effect on her marriage to her first husband, Frank (Tobias Menzies).